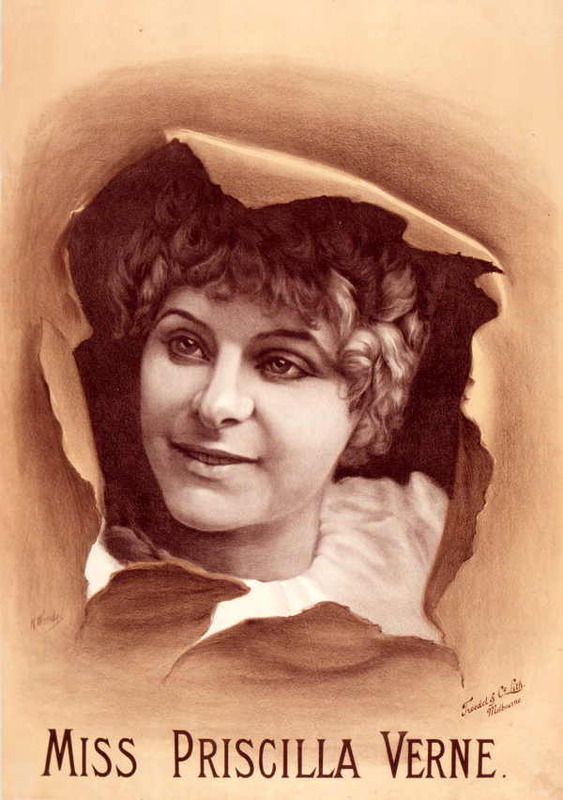 This is the famous English music hall singer, Marie Lloyd. She has nothing to do with this story, but I quite like the picture. 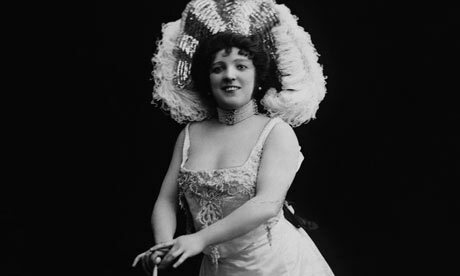 Miss Priscilla Verne readily consented to be interviewed. “To this,” resumed Miss Verne, “I distinctly heard a reply that made my blood boil, and I determined to do something. I consulted a solicitor, and he advised me to horsewhip the man. “Very reluctantly I did so, but I considered that I had been grossly insulted, and only wanted to revenge myself. “Accordingly, on Wednesday I penned a letter to Mr. M’Bride, and signed it ‘Alice Chalmers.’ I wrote that I was enraptured by his charms, and asked him to meet me at 1.45 p.m. on Thursday at the Town Hall corner. I added that he, perhaps, would not remember my name, but, doubtless, when he saw me he would remember me. “I ascertained that he had received the letter, and, accompanied by several other Fayre artistes, I lay in wait for him at the appointed place. He arrived with a punctuality that did him credit, and forthwith I proceeded to interview him. “He broke away from me, and hastily proceeded across the street. I followed, and with each stroke I took good care to let him know what it was for. “Have you ever had any such experience before?” queried our reporter. Accept this kiss and give me one. On Tuesday night, November 24, 1896, Miss Verne, as usual, took the leading part in the variety programme presented at the Olde Englishe Fayre. Miss Verne it is understood, pointed to Mr. McBride, because he happened to sit in the front row, and because he was, she avers, the first person to attract her attention at the critical moment. McBride, it is alleged, uttered a response in a tone of voice sufficiently loud to be heard by the singer, although she was several feet away, and by those around. If the words used are truthfully described, they were certainly insulting. Miss Verne at once paused, and glaring down on the delinquent, she retorted, “You low cad,” and those who knew the circumstances applauded her. When the show had terminated, Miss Verne reported the circumstances to Mr. George Jones, the manager of the Fayre, and at the same time made up her mind to resent the insult in her own fashion. In this determination she was heartily seconded by the other members of the company. She said that in singing the humorous song, ‘He sits in the front row,’ she had to point to some person occupying a front position. “On Tuesday night I pointed to Mr. Gus. McBride,” Miss Verne continued. “To my great surprise and indignation he made a most insulting remark to me as I stood on the stage. He spoke aloud, and others heard what he said. Mr. McBride states that he was insulted by Miss Verne and held up to ridicule before a crowd of people at the Fayre. He was sitting in the front row when Miss Verne sang one of her songs. At the end of a verse she pointed to him—singled him out, in fact—calling him by his name of ‘Gussie.’ She even said she would kiss him if he would go on the stage. He did not care to be made so prominent before so many people, as they could not help knowing that he was pointed out and was being made a laughing stock of. On the spur of the moment he retorted with the remark complained of. Perhaps it was a rude remark. He would not have said anything if she had not commenced it. The ladies of the company then met and decided that the man should be chastised. PERTH, Friday.—An extraordinary scene was witnessed in Howick Street, this afternoon, when Miss Priscilla Verne, the serio-comio singer, who is performing at the Olde Englishe Fayre, publicly chastised a well-known man about town. The ladies of the company then met and decided that the man should be chastised, and a plan to entrap him was arranged. Miss Verne wrote a notice, signing herself as ‘Alice Chambers,’ saying that she had fallen in love with him, and asking him to meet her at an appointed hour. He swallowed the bait, and strolled to the meeting place, where Miss Verne met him, and producing the cane, began to publicly chastise him. A crowd quickly gathered, and hemmed the two in, and before he could escape the man was severely drubbed. It is probable that the affair will be further ventilated in the police Court.